For other people named John Chiang, see John Chiang. 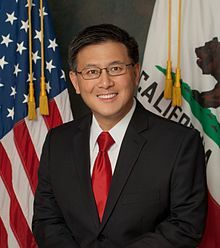 John Chiang (born July 31, 1962) is an American politician. A Democrat, he served as the 33rd California State Treasurer from 2014 to 2019. He previously served as California State Controller from 2007 to 2015 and on the California Board of Equalization from 1997 to 2007. On May 17, 2016, Chiang announced his campaign for Governor of California in the 2018 race but did not qualify for the runoff. Chiang is born to Taiwanese parents who immigrated to the United States. Chiang's father, Chiang Mu-dong (江牧東), a Pingtung County native of Hakka descent from Neipu, relocated to the United States in 1950 to pursue graduate studies at Cleveland State University, after graduating with a degree in chemical engineering from National Taiwan University. Chiang's mother, Shen Yin-hsiang (沈吟香), was a Tainan native, who studied abroad in Japan before immigrating to the United States to pursue further studies. Chiang's parents met at the University of Notre Dame, and soon married. Chiang was born in New York City and grew up in Chicago. He attended Carl Sandburg High School where he served as student body vice-president alongside student body president Dave Jones. Lifelong friends, Chiang and Jones ran again together in 2010 on the California Democratic slate, with Chiang winning reelection as state controller and Jones being elected California Insurance Commissioner. Chiang graduated with honors with a degree in finance from the University of South Florida and has a law degree from Georgetown University Law Center. His decision to pursue law was influenced by his maternal grandfather, Shen Rong (沈榮), who was a prominent lawyer in Taiwan. In 1987, Chiang moved to Los Angeles, where he got involved with the Democratic Party of the San Fernando Valley and the West LA Democratic Club. Chiang began his career as a tax law specialist for the IRS. He worked as an attorney for then-California State Controller Gray Davis, and also worked on the staff of California Senator Barbara Boxer. In 1997, Chiang was appointed to the California Board of Equalization after incumbent Brad Sherman resigned, having been elected to the U.S. House of Representatives. In 1998, Chiang was elected to the office; he was re-elected to a second four-year term in 2002. He was Chair and represented the Fourth District, primarily serving southern Los Angeles County. Chiang ran for California State Controller in 2006. He won the Democratic primary with 53%, defeating State Senator Joe Dunn. In the general election, he defeated Republican State Assemblyman Tony Strickland by over 870,000 votes. Chiang took office on January 8, 2007. Chiang ran for a second term in 2010. He was unopposed in the Democratic primary. In the general election, he had a rematch with Strickland, who had been elected to the State Senate in the intervening period. Chiang defeated Strickland again, by more than 1.8 million votes. In May 2007, Chiang released a report that found that the state of California "would have to pay an additional $2.2 billion annually" over 30 years in order to pay for health benefits for all currently retired state employees and current state employees who will be retiring. Chiang's actions were praised as having "gotten a needed discussion reignited". In June 2007, a U.S. District Judge banned the State Controller's office from seizing unclaimed property because the State was not giving "fair notice to the owner and public". Because a ban could cause the State to lose $300 million per year in revenue, Chiang took steps to improve the notification of people whose assets were about to be seized, including sending them notices, and to improve the ability of people to recover their assets once seized. In October 2007, the U.S. District Judge found that Chiang's measures "satisfie[d] constitutional due process" and lifted his ban. In July 2008, former Governor of California Schwarzenegger was reported to be planning to "slash the pay of more than 200,000 state workers to the federal minimum of $6.55 per hour," among other measures, due to a lack of an approved state budget. Chiang defied the order, characterizing Schwarzenegger's idea as "a poorly devised strategy to put pressure on the Legislature to enact a budget" and stated that he would continue to pay state workers their full salaries. He issued IOUs for everything from contractors’ payments to tax refunds. Chiang claimed that he had "both constitutional and statutory authority" to continue payments and that Schwarzenegger was trying to make Chiang "do something that's improper and illegal". He received support from the Democratic leadership in the state Senate and Assembly. When Schwarzenegger issued a formal executive order, Chiang sent a formal letter to Schwarzenegger "reiterating his position". At a rally of state workers in Los Angeles, Chiang called them "innocent victims of a political struggle". In a report issued in May 2014, California's Bureau of State Audits (BSA) concluded that ""The number and magnitude of errors we found indicate the Controller’s Office lacks a sufficient review process to prevent and detect significant errors." A Sacramento news station added up the mistakes, calculating that BSA had reported $31.65 billion in errors. The controller’s office concurred with the BSA assessment, saying that the problems were due to high staff turnover, challenges in recruiting qualified staff, budget cuts, inadequate funding, and late, erroneous data from numerous state agencies. Chiang was elected California State Treasurer in 2014, defeating Republican businessman Greg Conlon by more than 1.2 million votes, 58.8% to 41.2%. He was sworn into office on January 4, 2015, succeeding term-limited Democratic incumbent Bill Lockyer. Chiang imposed a 12-month ban from investment work on Wells Fargo in September 2016, barring the bank from underwriting California's state debt for a year. This was in response to the federal report announcing that Wells Fargo employees had opened up to 2 million unauthorized accounts in an attempt to raise Wells Fargo profits. However, just 8 months later, Wells Fargo won a competitive bid to sell $636 million of general obligations in California. This is due to a state law that requires Chiang to accept only the lowest bid at an auction. A spokesman for Chiang said they "were pleased with the price," and "it does not reflect our feelings about their behavior toward their customers." On May 17, 2016, Chiang announced his intentions to run for Governor of California in 2018. While polling at 11% in January and February 2018, he received 616,789 votes (9.5%) in the jungle primary and thus did not qualify for the runoff. Chiang has two younger brothers, Roger and Bob, and one sister, Joyce, who was murdered in 1999. Chiang is a Roman Catholic and cites his faith for his opposition to the death penalty. In 2016, he and his wife separated after a decade of marriage. They had no children together. ^ a b "John Chiang opens bid for California Governor". Sacramento Bee. May 17, 2016. Retrieved August 2, 2016. ^ "客家懇親大會移師洛城！山歌唱進演奏廳 - 蘋果日報". Retrieved 4 September 2018. ^ a b "台裔江俊輝從政選州長 受律師外公影響". 中央社新聞 (in Chinese). 中央通訊社. 25 May 2016. Retrieved 2016-10-12. ^ a b "台美人第二代風雲人物: 江俊輝(John Chiang)" (PDF). Taiwanese American Historical Society. ^ "US politician inspired by Taiwanese relative". Taipei Times. May 30, 2016. Retrieved May 30, 2016. ^ Yi, Matthew. Inaugurations - state offices - ceremonies, parties as state officials take oath of office. San Francisco Chronicle, January 6, 2007. ^ Gabriel, Roeder, Smith & Company. Other postemployment benefits sponsored by the State of California as of July 1, 2007. Accessed 1 Aug 2008. ^ Chan, Gilbert. Retiree health cost disclosed. Sacramento Bee, May 8, 2007. Accessed 1 Aug 2008. ^ State controller steps forward on retiree costs. John Chiang draws attention to costs of health care benefits for retired government workers. Orange County Register, May 11, 2007. Accessed 1 Aug 2008. ^ a b Walsh, Denny. Judge lifts ban on seizing assets - A group challenging the state's taking of unclaimed property plans to appeal. Sacramento Bee, October 20, 2007. ^ Chorneau, Tom, and Haley Davies. State will notify thousands before taking their assets. San Francisco Chronicle, August 24, 2007. Accessed 1 Aug 2008. ^ a b Wildermuth, John, and Matthew Yi. Governor plans to slash state workers' pay. San Francisco Chronicle, July 24, 2008. Accessed 1 Aug 2008. ^ "California Treasurer Who Shut Out Wells Fargo Eyes Top State Job". Bloomberg.com. 2016-10-20. Retrieved 2017-04-14. ^ a b "Wells Fargo, Banned From Bond Work, Wins California Deal Anyway". Bloomberg.com. 2017-04-12. Retrieved 2017-04-14. ^ Yi, Matthew. Controller says he won't cut workers' wages. San Francisco Chronicle, July 25, 2008. Accessed 1 Aug 2008. ^ Mendel, Ed. Governor, controller clash on pay-cut plan. San Diego Union-Tribune, July 26, 2008. Accessed 1 Aug 2008. ^ Yi, Matthew. Governor orders layoffs, heavy pay cuts. San Francisco Chronicle, July 31, 2008. Accessed 1 Aug 2008. ^ Letter from John Chiang to Arnold Schwarzenegger. July 31, 2008. Accessed 1 Aug 2008. ^ Rothfeld, Michael. Schwarzenegger makes layoffs, orders pay cuts for California state workers. Los Angeles Times, August 1, 2008. Accessed 1 Aug 2008. ^ "State of California Internal Control and Compliance Audit Report for the Fiscal Year Ended June 30, 2013" (PDF). California Bureau of State Audits. May 27, 2014. Retrieved May 17, 2018. ^ a b Ortiz, Jon (May 29, 2014). "Audit: State Controller's Office accounting riddled with errors". The Sacramento Bee. ISSN 0890-5738. Retrieved May 17, 2018. ^ "$31.65 Billion: California Accounting Errors Higher Than Combined GDP of Jamaica, Iceland". CBS 13. May 29, 2014. Retrieved May 17, 2018. ^ Statement of Vote, November 4, 2015, General Election. http://elections.cdn.sos.ca.gov/sov/2014-general/pdf/2014-complete-sov.pdf: California Secretary of State Debra Bowen. 2014. p. 6. ^ White, Jeremy (January 4, 2015). "AM Alert: Jerry Brown swearing-in, State of State launch new year of California politics". The Sacramento Bee Capitol Alert. Retrieved May 12, 2015. ^ Dean, Eddie (July 30, 1999). "The Murder Victim Next Door". Washington City Paper. Retrieved April 15, 2013. ^ Egelko, Bob (December 30, 2017). "5 of 6 candidates for California governor oppose death penalty". San Francisco Chronicle. Retrieved May 16, 2018. ^ Bureau, Bee Capitol (January 10, 2018). "Five things you need to know about John Chiang". Retrieved 4 September 2018 – via Sacramento Bee. Wikimedia Commons has media related to John Chiang. This page was last edited on 10 January 2019, at 15:46 (UTC).